Muhammad Ali has died. A tremendous fighter, both inside the boxing ring and out. The fact that he risked jail over military conscription during the Vietnam War shows us that he had a strong ethical (therefore libertarian-leaning) sensibility, which gives us an excuse to examine his horoscope in this political blog. Apollonian: Pallas conjunct Sun and ruled by Saturn which is trine Sun. The quindecile aspect is tighter than the conjunction, but conjunctions are generally stonger. On "The Axis of Good and Evil" this puts Ali between the "Libertarian" and "Statist" quadrants, probably leaning more to the "Libertarian" side. This is the primary anti-war vector. Capitalist: North Node on Second House cusp. Collectivist: Neptune in Second House. We have a strongly mixed economic signature, which usually (but not always) places the native in the Right-wing camp. Had Ali been more interested in the minutiae of economic policy, he might have started to lean to the Right. Conservative: Moon quincunx North Node. The "liberal" side wins (it has the edge in mixed-signature cases), but the "conservative" vector helps explain the black-separatist tendencies which were stronger in his youth. Libertarian-ish + mixed economics + mixed cultural -> closet libertarian?? It might have been interesting to see what might have happened had Ali been interested in more political issues than the Vietnam War and the defense and spread of Islam. Pallas trine both sign rulers of Moon and quindecile Fourth House ruler Pluto: the Pallas-Moon connection is the fighter's aspect in the horoscope. Pallas conjunct Sun: not only is this a strong libertarian vector but also is associated with focusing and/or "weaponizing" public personality expression. Public figures with this aspect very often become synonymous with a cause, an ethic, and/or a skill. I give a dozen or so examples in my Pallas lecture. Pallas tightly quincunx Ascendant: high physical agility. Sun-Mars-Pluto T-square: a life of fighting, and struggle against power. Saturn conjunct Uranus in the Tenth: rebelling against authority. Venus square Uranus/Saturn: Ali had four wives. Chiron in Leo opposite Mercury in Aquarius: speaking to the ills of the world; brain damage? Leo Rising: "I am the greatest". 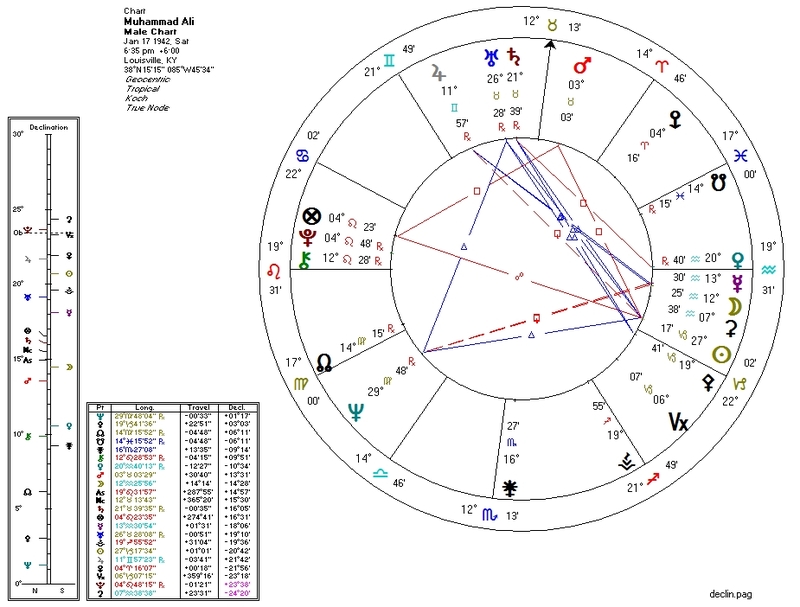 Sun-Pallas/Saturn-Uranus/Neptune grand trine: an inspiring, iconic rebel. At his passing, transiting North Node and Jupiter were conjunct Ali's North Node, suggesting a great boon or the beginning of a new journey. June 6, 2016 at 5:55 PM https://www.youtube.com/watch?v=lgouwh2Ir6Q Stefan Molyneux's alternative take on Ali's life.